Leo Ogor, Minority Leader of the House of Representatives, has hurriedly mobilised contractors to sites of various uncompleted projects in his constituency out of fear of the Economic and Financial Crimes Commission (EFCC), SaharaReporters has learned. 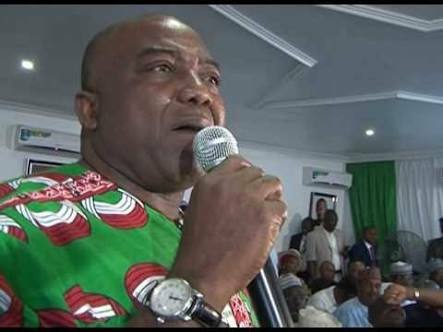 A security aide to Mr. Ogor, who represents Isoko Federal Constituency in Delta State, confided in our correspondent that since the EFCC turned its attention to his boss, the former Majority Leader has been overcome by fear, a development that has worsened his blood pressure. “Because of the trouble, my boss has decided to get some of the contractors back to site and they restarted work on some of the abandoned projects for which he may have collected the money,” said the aide. Mr. Ogor, whose battle with the EFCC began in 2017 over alleged corrupt practices, including 20 constituency projects branded as “suspiciously unexecuted”, SaharaReporters, gathered, hand-picked contractors said to his fronts, relatives and cronies. When SaharaReporters visited some of the project sites last week, contractors were seen working. Among sites visited werethe N2.1 billion Aviara-Uzere Road, awarded by the Federal Government in 2013; the 26.5 kilometre Isoko Ring Road Project traversing Ofagbe, Orie, Okpe-Isoko, Uro, Ada, Idheze to Ozoro, which was awarded in 2015; and the Araya Bible Site electrification project. Others were Oleh, Ofagbe Aviara and Ozoro communities where four 500KVA transformers are to be delivered. Equally visited were two communities in Isoko South and North Federal constituencies as well as the Isoko Development Union (IDU), where transformers are also expected to be delivered. Mr. Ogor has also got contractors back to Aya Primary School in Araya-Aviara and Uro Primary School in Uro-Irri, where classroom blocks are being built; Ekwerigbe Primary School, Egware Primary School, Ozoro and Uruogbe Primary School in Owhelogbo, where classrooms are being renovated. Contractors have also returned to Olomoro Health Centre, Okpadi community in Iyede, where they are installing solar-powered street lights. Mr. Ogor distributed one note book each to primary pupils in his constituency and flagged off N200 million free medical treatment programme. In addition, he delivered classroom desks to primary schools in Aviara, Uzere, Idheze and Orie, contracts for which were awarded to his relatives and fronts, but abandoned. In 2016, members of the House of Representatives Committee on Niger Delta Development Commission, (NDDC), during the defence of the commission’s budget by the then Acting Managing Director, Mrs. Ibim Semenitari, accused Mr. Ogor of hijacking projects to his community to exclusion of other communities. Two weeks ago, the Delta State Bureau Chief of Daily Trust Newspapers, Mr. Victor Sorokwu, narrowly escaped being killed by unidentified armed thugs suspected to have been hired by the Rector of the Delta State Polytechnic, Ozoro, Mr. Job Akpodiete; Registrar, Mr. S. O. Onaibre; and the Chief Security Officer (CSO) of the institution, Mr. Simeon Eduke. SaharaReporters reliably gathered that the journalist was attacked while working on a report on the NDDC ICT Centre project at the Polytechnic, which has been abandoned by Mr. Ogor. The journalist alleged that he was harassed, molested, arrested and detained by the Divisional Police Officer, (DPO), for over 10 hours at the Ozoro Police Station. “I was on an official assignment to the abandoned NDDC ICT Centre at the Delta State Polytechnic, Ozoro, where I was attacked by thugs working on the instructions of the school rector, registrar and the CSO. “I lost cash, phones and other valuables during the incident. I thank God for saving my life,” Mr. Sorokwu said. The EFCC, in June 2017, froze over N116 million in the accounts of five of the six companies with which Mr. Ogor secured contracts from some government agencies as constituency projects. The EFCC is also looking into a “curious” payment of over N318 million to two of the companies by NDDC as well as the discovery of 30 accounts, including six belonging to his companies. Last month, the commission secured a warrant to arrest Mr. Ogor over 20 constituency projects, which were tagged “suspiciously unexecuted”. The contracts, valued at over N500 million, were alleged to have been awarded to companies linked to Mr. Ogor. The scandal around Mr. Ogor centre around contracts awarded by the NDDC, Universal Basic Education Commission (UBEC) and the National Commission for Refugees, Migrants and Internally Displaced Persons. He was implicated in a Mr. Abdulmumin Jibrin’s petition against House leadership in the 2016 budget padding saga and insertion of bogus constituency projects.